Welcome to Vuican Barbecue Grill Mesh Company. Our company is a professional manufacturer specialized in the production of barbecue grill meshes and roasting racks. In the process of making BBQ grill mesh, we always adhere to using the high quality raw material and advanced processing technology. And our products are all through strict quality inspection, so there is no doubt the product quality has reached the international standards. Most importantly, our products are no harmless and tasteless when roasting and baking. So you can choose our products without anxiety. 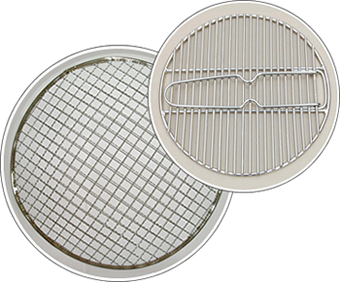 Which kinds of barbecue grill mesh we supply? According to the material: stainless steel, low carbon steel, high carbon steel, galvanized steel, copper, etc. According to the shape: round, ring, oval, rectangular, square, fish-shape, etc. According to the surface treatment: zinc coated, chrome plated, copper plated, nickel plated, tin plating, polishing, electrolysis, etc. According to the handle or supporting leg: with or without handle or supporting leg. According to the handle material: metal, wood or plastic. 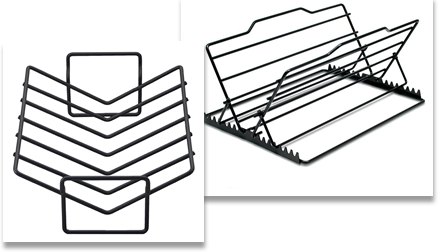 According to the service life type: disposable type and reusable type. 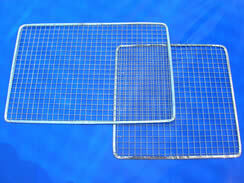 Barbecue grill mesh includes disposable barbecue grill mesh and reusable barbecue grill mesh. If you need a portable and economical grill mesh and want to use in outdoor roasting, disposable barbecue grill mesh usually with woven wire mesh and wrapping edge is your best choice. But if you want to use the grill mesh repeatedly, the reusable barbecue grill mesh is your best choice. It is generally made of food grade stainless steel with welded edge, so when you are roasting, it will not produce poisonous materials that will damage your health. If meat or vegetables you are grilling are very small, you can choose grilling basket with lid. Grilling basket with lid can prevent the small pieces of meat or vegetables from falling off when you flipping. And the firm handle can also help you easily flip the grill mesh and not burned by the metal edge. 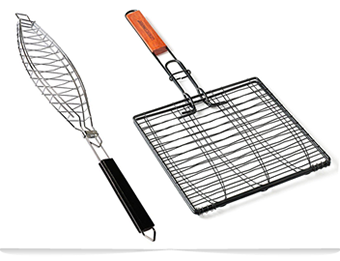 In addition, our grilling basket also includes detachable handle type. When you use the basket, you can use the whole part and you can also use the grilling basket without the handle. What's more, the detachable handle grilling basket can be washed in dishwasher. Thus you will have no cleaning problem. If you want to have a fish roasting party, the fish grilling basket is your best choice. The two sides of the basket latch together can allow grill the fish securely. And the handle of the basket can allow you flip the fish timely. 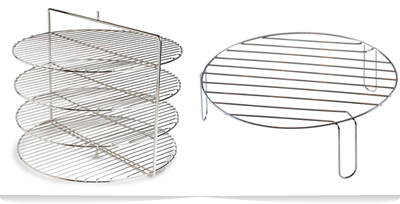 And if you want to grill more fish at the same time, the triple fish grilling basket is your best choice. 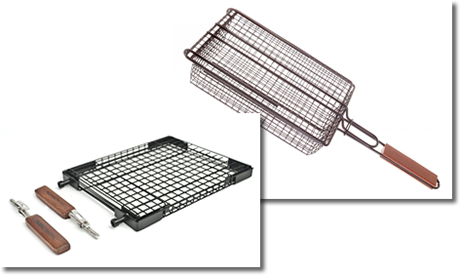 But our triple fish grilling basket is especially suitable for thinner filet and smaller fish. So if you caught or bought bigger and thicker fish, this grill is not suitable for you to grill. 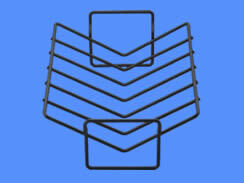 V-shaped roasting rack is especially suitable for turkeys, chicken, ham's roasting rack. If you want to roast a 20 pound turkey or goose, the heavy duty non-stick roast rack is your best choice. It is strong and durable and the non-stick plating not easily come off. And if you want one that easy storage, the adjustable V-shaped roasting rack is your best choice. It not only can fit for poultry in different sizes but also can be easily stored and washed. What's more, it can be used with different roasting pan. If you want a barbecue tool not only can be used in roasting meat but also can be used in roasting wheaten food in microwave oven, the roasting rack with supporting legs is your best choice. And if you want to roast more food at the same time, the multi-layer roasting rack is your best choice. You can roast meat and bake bread, cookies and cakes to satisfy many people's appetite at the same time. As you can see, our company has so many barbecue grill meshes and roasting racks for you to chose, and you are sure to find what you really want in our company. Do not hesitate any more and choose your favorite one. If you are interested in our barbecue products please provide: barbecue products' raw material, wire diameter, barbecue products' shape, edge processing methods, using type and quantity. In addition, if you want to know more information about our products and services, please browse our website or mail at sales@bbqgrillmesh.com. Barbecue grill mesh made of stainless steel, carbon steel, galvanized steel, with heat and fire resistance, is widely used in roasting meat. 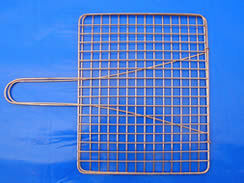 Disposable barbecue grill mesh with portable and economical advantages is widely used in outdoor roasting. Barbecue grate generally made of stainless steel features firm welding point and stable structure. It is widely used in roasting meat in picnic. V-shaped roasting rack with special V shape design and adjustable structure is especially suitable for roasting turkey, chicken or duck. 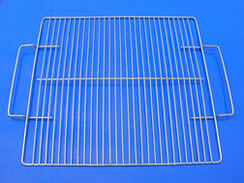 Barbecue grill mesh or roasting rack are used for roasting meat. For better use and maintenance, here are the usage caution and cleaning instruction. RSSCopyright © Vuican Barbecue Grill Mesh Company Add: NO. 115 Huabei road, Anping County, Hengshui City, Hebei Province, China.